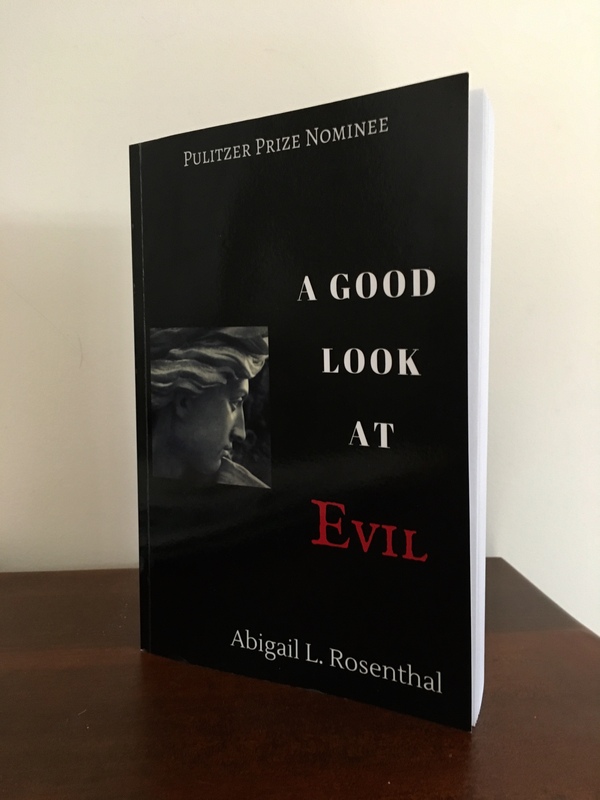 Evil Is Understandable | "Dear Abbie: The Non-Advice Column"
Amazon Customer Review of Abigail L Rosenthal’s A Good Look at Evil. Eugene: Wipf and Stock, 2018. Abigail Rosenthal is a professor (emerita) of philosophy, which is not the same thing as being a real philosopher. Indeed, there are few enough books written today by genuine philosophers. This is one. Like Socrates, she also conducts conversations with the many non-philosophers, but unlike him, she does so over the Internet in an online column, “Dear Abbie: The Non-Advice Column.” Any book with the title, A Good Look at Evil looks to be heavy going, but Rosenthal’s treatment of an undoubtedly important philosophical problem is remarkably accessible to anyone who still retains a hold on commonsense. To begin with, she takes the view that “good” is the ability to work out one’s own story, the story of one’s own life, what she calls a corrigible nonfiction narrative. And evildoing is the deliberate prevention or interruption of working out your own life-story, whether you do it to yourself or to somebody else. Stories, literally, reveal who I am –as when, having been offered a bribe of some kind –money, a promotion for considerations, a #MeToo opportunity– one says: “that’s not who I am.” This is, then, a genuine and practical philosophy of existence, a recovery of the understanding of philosophy as a way of living. Moreover it is devoid of the high sounding and usually empty words we often associate with philosophy, words that properly speaking are the verbal coin of the realm for intellectuals, sophists, PR flacks and similar frauds. Rosenthal relies on Aristotle, Kant, and other great predecessors for what we now call a philosophical anthropology, that is, a philosophical understanding of human being, as well as upon more lightweight contemporary moral philosophy. She draws some delightful portraits of contemporary miscreants –the gambler, the rake, the seducer. She tells us a good deal about why politicians, as distinct from statesmen, are rightly held in contempt, and not just in America, but in Canada, Europe, Latin America, Russia, Africa, Asia. Everywhere! Why? Because, she explains in detail, they are invariably sell-outs. One way or another they betray the trust that reposes in their office and do so for unworthy motives. And everyone, including them, knows it. It happens on the grand stage of world politics and the petty stage of academic politics. Political correctness is just a recent instantiation. The paradigm case where genocide is linked to mass murder is the Holocaust. Inter-tribal destruction, even the example where Western cultures extinguished aboriginal cultures by killing the aboriginal population, as in Tasmania and Newfoundland, do not compare to the Holocaust because the numbers of human beings murdered is not comparable. Moreover, butchery motivated by desire for loot and power or by cultural contempt is (or seems to be) less malevolent than the meticulously planned and executed Nazi murder of so many millions of Jews. Here we have a genocidal holocaust, not mere mass murder or cultural genocide. That is about as evil as it gets. Worst of all, it took the teamwork of the Germans, either active or passive, to get the job done. Under such circumstances, Rosenthal argued, the only appropriate response is to do whatever one can to survive. Blessings on your thoughtful head, Judy. What I particularly enjoy about this review is that it brings in readers of this blog and me, its humble author, as characters on the streets of Athens — cyberspace being the latter-day equivalent of the streets of ancient Athens — buttonholed by Socrates who asks his fun questions, like, “What is Justice?” And we all get to pitch in! Mazel Tov!! This is a wonderful review, and enticing as well.